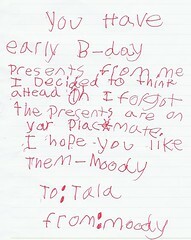 This month marks Tala's 7th birthday! August 26 is also the first day of school. She turns 7 that same day and becomes a second grader! It's the first time her birthday falls within the school year; she's excited. 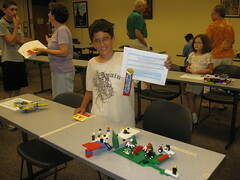 On August 7, Moody participated in the Lego competition at the Westerville Public Library. He won first place for his age group and got a certificate and a $10 gift card from Lego Land which opened recently in Easton. On the same week he joined the Cub Scouts Day Camp, Walking With The Dinosaurs. He had enormous fun! His buddy Toby is coming for a playdate today. Moody can't contain himself. 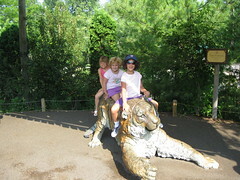 On the Tala front, she went on a trip to the Zoo today with the girl scouts. She is now a Brownie. We planned on going, all of us. But I wasn't feeling good, so Sol ended up taking her. She had a blast, my sweetie! Last weekend, I went shopping. 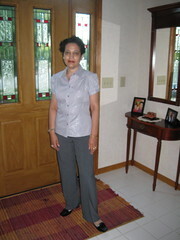 I had nothing that fits me well anymore, not even shoes; all my clothes were loose and baggy. I was surprised to find that I now fit in size 6, for the first time in my life. The smallest I have been was size 8. It's been a week and now those clothes are getting a little looser. It scares me sometimes and I keep wondering when is my weight loss going to stop. Definitely not with the nausea around. I had a tough time this week with the nausea that I wasn't able to sleep well the last 2 nights. I have an appointment with the oncology surgeon on Monday. I hope he can find something to cure and help me get rid of the nausea. Work is going very well, and I'm liking it a lot. My department didn't exist before, so everyone except for me is new to the company. The nice thing is that they are all highly qualified and seasoned professionals, which makes it fun and enjoyable to work with them. There are more changes happening at the workplace to integrate us more with the corporate in the UK. Change is always good! 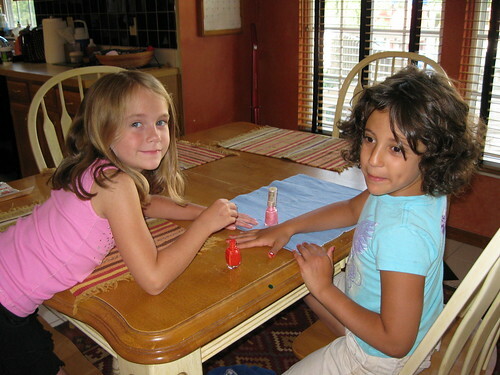 My sweet Tala and Taylor, her "Best BFF", at a sleepover in our house polishing each others nails.